Life Force is a boutique wellness travel company that combines captivating global destinations with a team of the world’s most beloved and innovative holistic experts, spiritual leaders, eco adventure specialists, yoga teachers, cultural guides, and business game-changers. We blur industry lines, create environments conducive to change, and expand the way our rapidly growing community of forward thinking corporations, luxury travelers, and intrepid seekers view wellness, travel and life. Each of our custom itineraries feature four elements – access, adventure, connection and transformation – to merge what we believe is most fundamental to a wellness travel experience with the dreams and aspirations of our guests. Simply stated, we connect, expand and evolve with our community and provide the perfect recipe to Find Your Force. A Life Force Ambassador uplifts and engages an extraordinary community of thinkers, healers, and change-makers. Together, we transform the world one soul at a time, starting with our own. Life Force Ambassadors are citizens of the world, teachers and students of holistic wellness, mindful seekers, and trail blazers. We are an intimate community on a mission to provide life altering experiences in a world that is thirsty for authentic introspection, community, and love. Life Force Ambassadors are storytellers and students of life, eager to share profound lessons from our individual and collective life experiences. If you are a self-motivated and dedicated teacher/professional in any of the areas listed on the right, becoming a Life Force Ambassador could be a good fit for you. Life Force has an extensive and inspiring network spanning the globe. We work with an exclusive clientele in some of the most beautiful and life-affirming destinations in the world. Life Force Ambassadors have an exciting opportunity to work alongside other top wellness industry professionals to inspire, educate, and guide dynamic groups of business leaders, global influencers and travelers on profound wellness journeys. 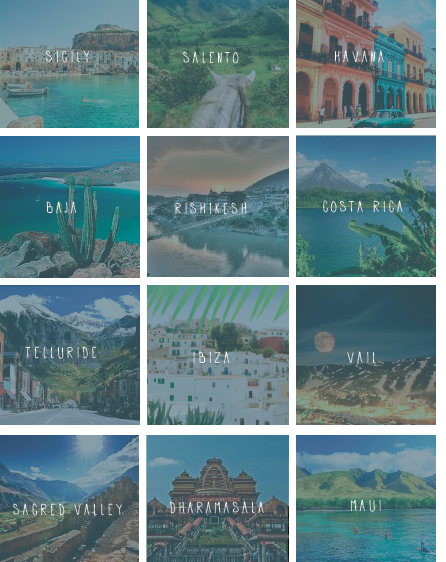 Our retreats are held in spiritual, cultural, and breathtakingly beautiful destinations around the world where we have personal connections and access to authentic and exclusive experiences. Think dream locales like Sicily, Italy; Salento, Colombia; Havana, Cuba; Baja, Mexico; and Dharamshala, India. We also work with innovative organizations and leading travel companies such as Exclusive Resorts, University of Denver, Telluride Yoga Festival, and Guayaki Herba Mate. Get creative. If you have other platforms, promotional ideas, or opportunities that you feel are a good fit for Life Force, let’s discuss and make it happen! At the end of the first three months, we will have a reflective conversation on your Ambassador experience and adjust our collaboration as needed to ensure you are feeling engaged within the Life Force community and we are meeting mutual goals. We are always interested in fresh ideas for storytelling, especially opportunities that foster collaborative and beneficial outcomes for Ambassadors and the overall success of Life Force. Want to join the Life Force Ambassador Family? Life Force Project, LFP Ltd.